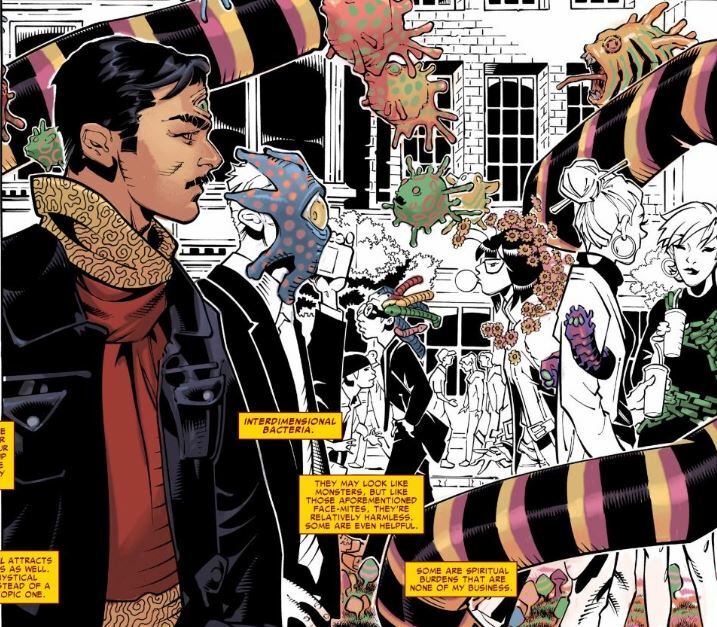 This 2015 Doctor Strange series starts with a recap of Doctor Strange's origin done in Silver Age style art, and it does so - impressively - in only one page of this comic. If you haven't seen the movie then perhaps you've read the original tale in Strange Tales: Arrogant doctor . . . damaged hands . . . the Ancient One . . . Sorcerer Supreme. This one-pager makes for a logical - and concise -starting point. 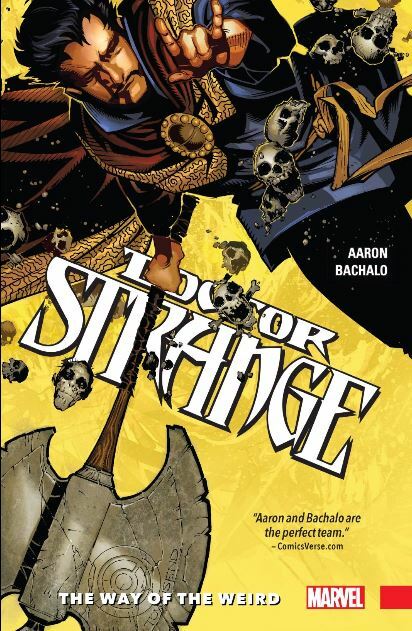 With that, we leave the sixties behind and jump onboard into the new adventures of one Stephen Strange . . . It is chaos as we join Stephen in the middle of a battle he is waging against an army of mystical invaders. Including this teddy bear. Actually most of his opponents are both gross and grossly powerful but this "teddy bear" is symbolic of the general art style taken when portraying the mystic realms in this series. 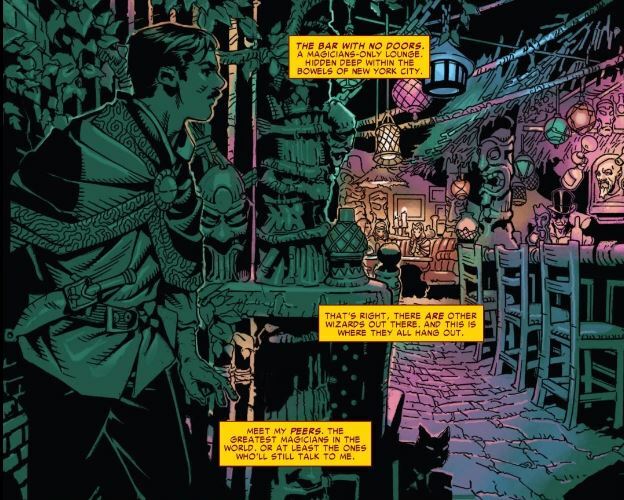 There is a very palpable sense of whimsy in the portrayal of the magical landscapes and associated denizens when compared to the dark horror vibe of some of the previous Doctor Strange comics. And that is not a complaint, quite the contrary, I love the whimsical slant. Another thing that I like is the Doctor's repeated use in this series of magical weapons patterned after medieval weaponry. I enjoy the spells - Crimson Bands of Cyttorak, Vapors of Valtorr, Shield of the Seraphim, Hoary Hosts of Hoggoth - oh, how I enjoy the spells. But these eldritch swords and axes work too. 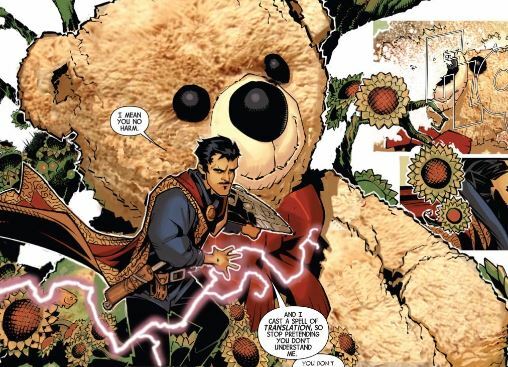 One thing that the new series will put in front of us is the cost to Stephen Strange of the mantle of Sorcerer Supreme. One of the ways to bring that across visually is to have Strange hacking away and "getting his hands dirty". This initial fight scene is concluded with a beautifully laid out panel. 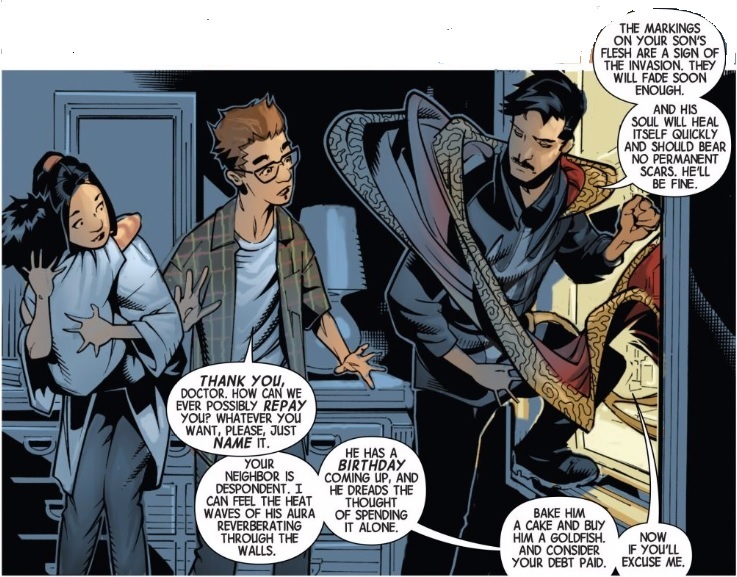 Doctor Strange, it turns out, is on a house call. The mystical invaders have encroached on the psyche of a young boy shown here on the bed with strange markings on his body (with the problem solved the Doctor assures the parents that the marks will eventually disappear). When the matter of remuneration is brought up the Doctor's response has pretty much decided me that this issue (and series) is going to be really good. The concept of a "third eye" is well known. Here the Doctor uses his third eye to show us an invisible world interacting with our own without us being aware of it. One of the scariest phrases the Doctor utters in these pages are the words "your are never alone". The Bar With No Doors is located deep under New York. My impression is we're not talking Morlock tunnel level. Deeper. Inaccessible except to its exclusive clientele: magicians. I've seen something like this before but in DC Comics, they call it the Oblivion Bar. The panel above is from the Day of Vengeance series, a part of DC's Infinite Crisis event. Unlike the Bar With No Doors, the equally inaccessible Oblivion Bar isn't located on Earth. 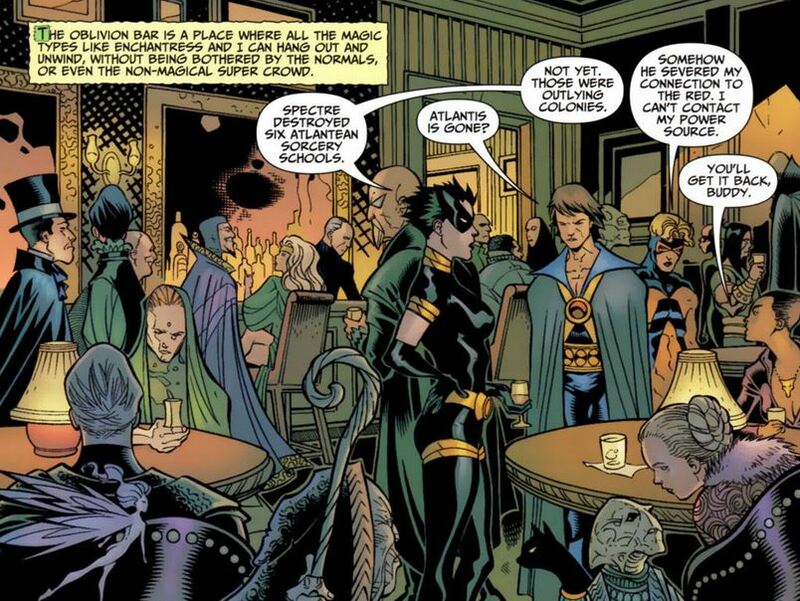 Anyway let's go back to Marvel's Bar With No Doors. I love the concept of a hangout place for magic types, I mean just look at a sampling of the patrons. Most intriguing to me is Monako. His curious reference about fighting Nazi warlocks has me wondering if he is an old Timely character - I wouldn't be surprised if he was. Aside from being a curious character, Monako also brings up the aforementioned theme that the practice of magic always exacts a price - the plotlines will return to this concept again and again as the series unfolds. From the Bar, the Doctor heads on back to his house. We saw him making a house call a while back now it is he that gets a visit. A visit from Zelma. Zelma has a big problem. Huge. The good news is she's in the right place for a solution. As the Doctor is looking into it, Zelma's problem literally explodes. And this is where we leave off of this part of the story, but before closing out the issue, we get an epilogue. 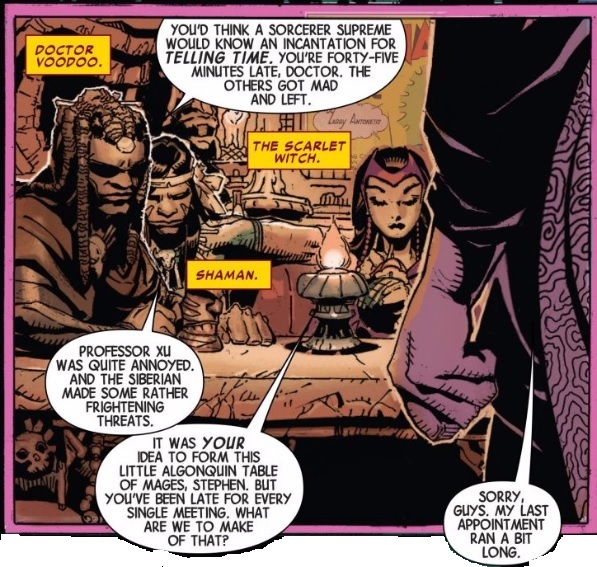 Meet Szandor Zoso, the Sorcerer Supreme of the 13th dimension. 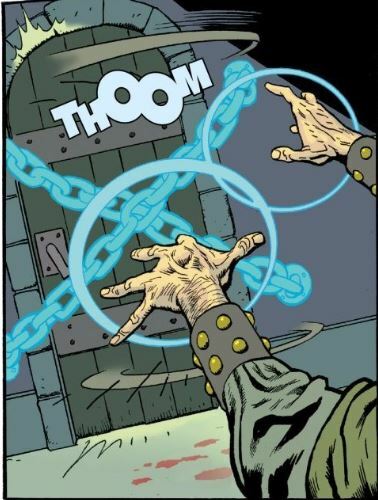 Like Stephen Strange, Szandor Zoso (known by his superhero alias as Dr. Seuss), has a talisman - the Eye of Thelema. That's right, Dr. Seuss has the Eye of Thelma. The neat butterfly effect is an SOS that Szandor is sending out to the other Sorcerers Supreme. This is because Szandor is in dire trouble. He is being pursued. Bloodied and losing his magic he still manages to cast this beautiful protective spell. The Empirikul are witch hunters. 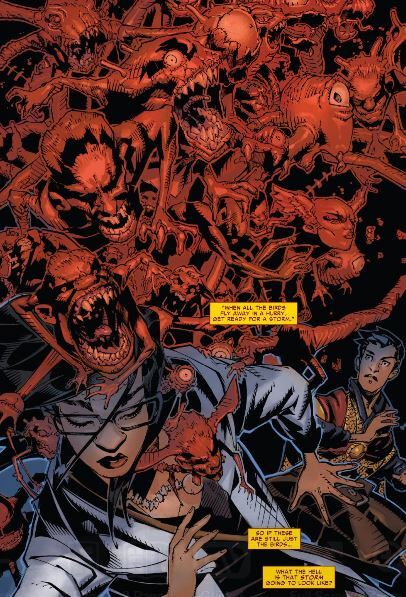 Aiming to eradicate all magic, thus their preoccupation with hunting down Sorcerers Supreme. Once again I recall DC's Day of Vengeance series, in that series there was also a massive campaign against all things magic and it was the Spectre who became the witch hunter. 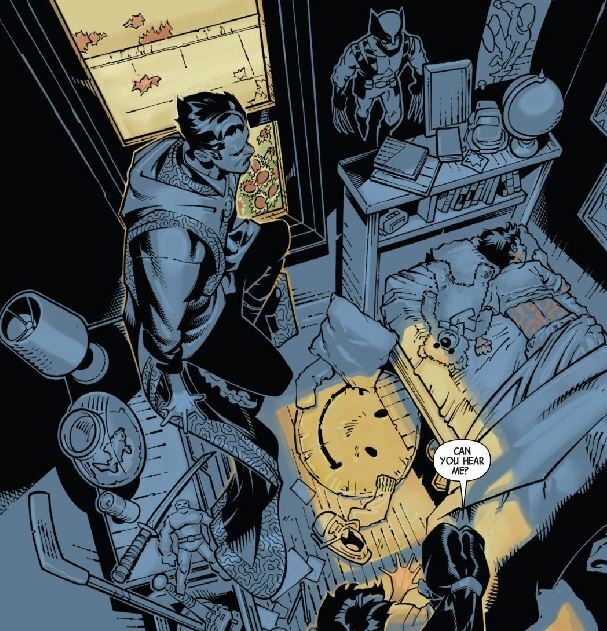 I really like the subtle foreshadowing that has been happening before this epilogue and then this big reveal and then, in subsequent issues, the coming of the Empirikul will be skillfully handled so that there is a steadily building feeling of dread. Very nicely done on the one hand, on the other hand, with this kind of build up, the expectations for a satisfying finish to the tale is very high. And with that, the issue ends.